Since its launch in September 1995, eBay has been a continually evolving "work in progress." Although it runs on a seemingly fully matured business model, the truth is that eBay is, and will be, a hub of continuous change and improvement. It's the always-on and ever-available marketplace to sell goods and garner profits. It is self-contained and allows sellers a place to set up shop, largely in their own way and at their own pace. Here's a brief retrospective to give you a refreshed view of how the eBay experience has enabled—and sometimes challenged—entrepreneurs from around the world. More than a mere nostalgic stroll down memory lane, this look back also offers renewed motivation to you, the seller, as you continue your march forward to continually grow your business, no matter what your goals might be. In case you weren't around for its modest launch, eBay started out as bland, gray-toned Web site named AuctionWeb. The brainchild of its creator, Pierre Omidyar, AuctionWeb was tangible expression of the notion that a perfect marketplace could exist where buyers and sellers meet to dynamically establish the value for goods. It was the classic mix of supply versus demand, with the X factor being the number of potential buyers who would competitively vie for buying rights to an item up for bid. As the saying goes, nothing's worth anything until at least two people want it. Omidyar's AuctionWeb put that assertion to the test, and so was born what became the eBay marketplace. So what exactly has transpired since the humble bow of AuctionWeb and what have been the evolutionary signposts along the way? The first point of acknowledgement is that eBay is a microeconomy, a self-contained marketplace and sales platform, all to itself. Through its phenomenal growth and reach since 1995, it has become a complete consumer experience within its own nimble marketplace that can alter direction quicker than most traditional commercial companies of similar size. First, eBay was conceived on the fundamental belief in the "free market." By his original concept, Omidyar determined he would establish a marketplace where sellers would decide for themselves what they would sell, and buyers would decide how much they would pay. This is the core ingredient that has enabled eBay to grow "organically" since day one, and, although it might bear little resemblance to that early concept all these years later, the truth is that the "perfect marketplace" assertion is what continues to keep eBay viable. Next, eBay introduced a concept of "light legislation." Another of Omidyar's original precepts was one of self-governance. This was the seed that germinated to grow eBay's Feedback Forum, allowing users to rate one another and clearly instill reliance upon maintaining a positive reputation to support business growth. Certainly, the feedback process has endured contention over the years, yet it remains a driving force in guiding buyers and sellers to work together in order to do "good business." Then, eBay encouraged "voice of the community." Over the years, eBay has actively solicited user feedback and hosted one-on-one meetings with groups of sellers (something former CEO Meg Whitman conducted personally during her tenure) to maintain a pulse of the user experience. 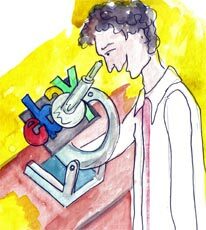 The eBay team established site forums then closely monitored questions, complaints and ideas from users. Though the site has grown far beyond those days of small-town trading, it maintains open forums, where users can join the conversation, or simply sit back, listen and learn. When eBay acquired PayPal in 2002, it created a seamless transition from bidding and buying to payment and collection. By doing so, the site solidly addressed one of its inherent failings: While auctions could be conducted at the speed of the Internet, payment was still dragging at snail-mail pace. And, when online postage appeared on the scene, the entire experience became a complete toolset to sell goods online, moving at the rapid pace of that perfect marketplace. eBay's growth beyond America enabled buyers to transact on a global basis. Geographic barriers were effectively eliminated when eBay launched in Canada, Germany, China, Britain and elsewhere around the globe. While eBay was clearly improving its profit potential via a global presence, it also enabled sellers to transact anywhere in the world, virtually, to significantly expand their ability to buy and sell in new markets. All told, these summarized achievements led to an explosion in the new wave of microbusinesses: small businesses that can be initiated by a single individual yet can operate at the same or similar level of a conventional business. eBay has done well, but how about you? Operating overhead has all but been eliminated by eBay's ready-to-use business model and captive audience of consumers. New businesses can get started on minimal inventory investment (most established sellers started their ventures with the accumulated goods stowed away in their own closets, garages and attics). Sellers can enter markets with less price pressure, and potential for reasonable profits, due to being able to avoid traditional overhead costs of office space, storage facilities and other such profit siphons. Most encouraging about all of this is that you can effectively spread the word of your up-and-coming business ventures for practically pennies by floating your marketing balloon in front of the eyes of nearly 100 million registered eBay users. That's good business, that's a strong economic situation, and that's the reason the eBay microeconomy is alive, well and serving you. I see a lot of unsatisfied online sellers from ebay or craigslist. You can try www.localDealr.com, they are a new web startup and I can personaly say that they are the best at helping people sell stuff online. It is a great experience and I highly recommend them if you want to sell stuff or buy stuff either online or locally. I hate to agree with all the prattle written here, but I do, unfortunately. Ebay has forgotten about us "little guys" to a large extent. Even those of us who have played on eBay for a good long time simply cannot keep up with all the changes and the ever-higher fees. I'm saddened to have to say this, but I do believe I am seeing the end of my time on eBay as these others. I just can't make a cent. I agree with lot of those comments. I have to say there is not 100 percent support for sellers and the fees on E-bay in this economy is far high and I do not see much profit after very high shipping and all charges involved. I just try for a bit after long time when I started 1998 and and quit for 12 yeas come back recently nothing to compare what wonderful business I had before ,looks like I am going quit there to sell. EBAY WORKE HARD TO LOSE THEIR IDENTITY AD EXCLUSIVENESS IN THE MARKETPLACE. THEY ARE KILLING OFF THE SELLERS THAT HELPED BUILD EBAY AND CATERING TO THE LARGER MARKET. EBAY MAKES MONEY AND THE SELLERS KEEP SCRAMBLING. FEEDBACK IS A JOKE. NO REAL SUPPORT FOR THE SELLERS. I totally agree with all the comments - the feedback system puts the seller literally at the mercy of the buyer, who doesn't read what is written and often doesn't have a clue as to what's going on. I sure hope Sprog's alternative arrives soon! Takes on Amazon with biggest purchase since Skype. New services planned to give buyers more flexibility. Ask Auctiva: An Alternative to eBay? VP of Engineering Tom Urbanowicz answers this and other questions from Auctiva customers.